One thing we know for sure is that executives of big corporations are frustrated with leadership development programs. Internally-run programs have a high fall-out rate either through employee performance problems (e.g. book smart, but not practical smart) or poaching by recruiters. Leadership development programs supplied by third parties typically over-promise and under-deliver. Sure, corporate leadership development programs help some people here and there. But, they are expensive and largely unsuccessful. These outcomes suggest that the common approaches taken for leadership development – e.g. competency models, emotional intelligence, and the like – are ineffective countermeasures because the actual problem and its root causes are not understood. Toyota-style kaizen is a much better approach to leadership (and organizational) development because it embeds context, is connected to real work, changes mindsets, and the results are measurable. When used as the primary approach to leadership development, whether for new hires or veteran employees, kaizen delivers highly concentrated and deeply memorable learnings that can be applied across the entire business. Kaizen teaches far more about cost, quality, delivery, lead-time, safety, people, processes, etc., than one could ever learn in school or by occupying staff management positions in finance, quality, engineering, human resources, operations, or IT. And it also teaches about non-cost costs, which nearly everyone ignores, but which can greatly influence long-term business success. Every business needs leaders at all levels who understand costs. But school teaches only cost knowledge. Kaizen teaches cost awareness. There is a big difference between the two. It also teaches process awareness (flow), quality awareness, people awareness, and so on. Every business also needs leaders at all levels who understand time. Importantly, kaizen teaches time awareness. Schools don’t teach that, nor do leadership development programs. That is a gaping hole that kaizen readily fills. Kaizen also improves people’s capability for thinking, judgment, and making fact-based decisions. In other words, kaizen helps leaders avoid making common errors – errors that your competitors are surely making every day. If you don’t make those same errors, you will soon be way ahead of them. And kaizen teaches leaders how to develop other people so they can help to quickly improve the business. Kaizen is, by far, the best method for training people how to lead businesses that serve competitive buyers’ markets. It is the only leadership development method that has major business impact. Businesses are made up of people who, no matter the discipline, have largely been educated the same way in school and on-the-job. They have the same equipment, same computers, same software, same processes, same leadership development programs, etc. What does this tell us? They think the same way. But you don’t have to. The distinguishing source of competitive advantage is leaders who understand and practice Toyota-style kaizen. So, think of kaizen – kaizen forever – as a simple and low-cost leadership (and organizational) development strategy. 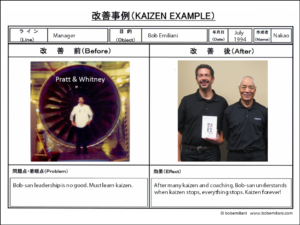 Kaizen has so many positive knock-on effects that you will soon view the common methods once used to develop company leaders as both expensive and ineffective in relation to actual business needs. Great post. I always enjoy seeing people, especially in healthcare, get engaged and excited by the daily practice of Kaizen. It requires their leaders taking a different approach, as you say (lack of Kaizen as a current state is not the fault of the workers). Kaizen doesn’t just solve problems, it develops people… the only true competitive advantage an organization can have these days. Great post. In the 18 months I lived in Japan, I found that the spirit of kaizen – developing people to engage in continuous improvement – was the unifying success factor. The companies I saw may not be practicing all elements of TPS, but they had a fundamental belief in kaizen and using the principles of people development and continuous improvement to find their own way to deliver value to customers. Too often people focus on the tools without understanding the true kaizen spirit and mindset. Great post- Bob! You have shared here an amazing blog on developing leadership excellence through productive leadership strategies. But my point is, does every leader know how to develop an effective leadership strategy? I don’t think every leader is aware of their principles and tactics that are required for the development of the organization. From my standpoint, a leader must be credible, proficient, and dependable- publicly known for what he does, and the outcomes what he delivers, rather than what he says. He must be less concerned about his designations and titles and more about developing his employee performance and creating a positive work environment. He must be focused and ready for all the exceptions. I think by implementing these principles a leader can make a huge contribution towards his company’s success.